In MARCH 2016 I offered to help an adult adoptee born in 1957 in Jersey City, New Jersey who had done autosomal DNA testing with AncestryDNA. Bridget* had obtained some non-identifying information from Catholic Charities who had arranged her adoption, and had reunited with the family of her now deceased birth mother (named in adoption paperwork) who descended from Irish immigrants (corroborated by tree research and DNA results). She asked for help in CeCe Moore's DNA Detectives Facebook group finding an older maternal brother who had also been given up for adoption about 1949 according to her non-identifying information, as well as any paternal siblings. Her birth father was still a mystery, supposedly a man named Ray of Italian ethnicity born about 1924 who worked as an assistant manager at a grocery store. Bridget's AncestryDNA ethnicity estimate was consistent with the ethnicity information provided in her non-identifying information. 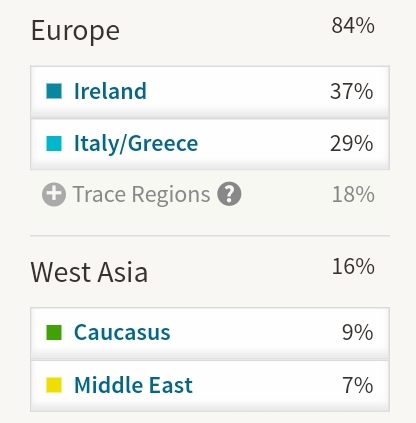 The combined percentages for Italy/Greece (now called Europe South), Caucasus and Middle East comfortably represented one parent of Italian ethnicity. As she did not match any siblings at AncestryDNA she uploaded her raw AncestryDNA data to the GEDmatch and FTDNA autosomal databases (both allow free uploads) and at my suggestion ordered another test from 23andMe in case any siblings or their descendants had tested there. This is called "fishing in all the ponds" in genetic genealogy circles. Both my parents were born in England and Bridget has fewer AncestryDNA matches estimated to be 4th cousins or closer than me, consistent with recent immigrant ancestry. Her closest DNA match at that stage was a predicted second cousin (2C) with partial Italian ethnicity and no Irish ethnicity. She has no visible family tree, hadn't logged in for over a year, and has never responded to messages. Bridget had found someone with the same username on social media who fit the bill in terms of general location and listed ethnicity regions. I built a tree for her and Bridget made contact with various family members, but we could not find Ray in her tree or figure out a connection to Bridget's other matches. 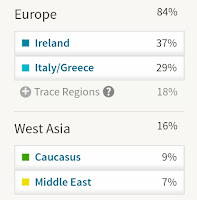 In MAY 2016 Bridget gained a new match at AncestryDNA, a predicted first cousin (1C) with part-Italian ethnicity who also matched the part-Italian 2C. She was 21 years older than Bridget and based on autosomal DNA statistics the most likely relationship was a high-sharing half-aunt or first cousin, or possibly even a low-sharing half-sibling (AncestryDNA does not yet have a chromosome browser and the match had not uploaded her raw data to GEDmatch so I couldn't check whether they shared an X chromosome as paternal sisters do). I made a private tree for her based on a few clues in her Ancestry profile. Her father born in Italy in 1910 was from a large Italian immigrant family that settled in the city of Albany, New York, and matches she shared with Bridget had ancestors in their trees who lived in the same southern Italian region the family emigrated from. (Bridget has since been assigned to AncestryDNA's Southern Italy genetic community and more specifically the same Campania region.) Her mother had no Italian ancestry. I researched the match's Italian family, supplementing immigration and census records with obituaries, city directory listings and miscellaneous newspaper articles. ** She had no obvious half-brothers and her father and four Italian uncles were all considerably older than our Ray and none of them worked in a grocery store. There was also no obvious explanation for how DNA from this Albany family ended up in Jersey City. Alas, Ray or someone like him was nowhere to be found in her tree and I started to have serious doubts about his description. *This is a true story. I have permission to blog about the people who asked me for help but have not used their real names for the sake of their privacy. I have tried to limit my writing here to information pertinent to their DNA searches, but have shared other fascinating details I found with them in tree format. **Some newspaper search sites I use are Findmypast, Ancestry, Fulton and NYS Historic Newspapers. Google sometimes brings up articles the other site search engines do not.